AION‘s Solorius festival is under way and players have several opportunities to get their hands on Christmas-themed goodies. 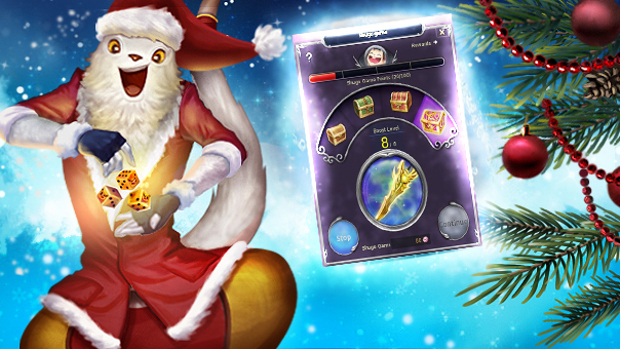 Currently, there are two holiday events running in the game: Lucky Dice and the Shugo Game. The first event will run until December 20th. As the name suggests, players will be rolling dice for a chance to win glorious prizes. Players roll the dice in order to move about a board, earning prizes based on where they land. The game can be accessed using the golden die icon in the bottom right of the UI. Players will be given one die every week to play with, so long as they have a character level 46 or above. Other dice can be obtained via the AION Shop. These are available to anyone who is level 15 or above on accounts created before November 29th. The Shugo Game will run until January 3rd. During this time players will be able to earn game tokens that can be used to win valuable prizes. Other events taking place this month are the Solorius Lottery (December 6th), Snow in Atreia (December 6th), Daishun’s Random Box (December 13th), and the Kumuki Event which will run over several different days. Players can also look forward to crafting, AP, and drop boosts. For full details on all the events, head over to the AION forums and browse the post.